I've been spending time at Google Books searching 19th century books, doing "primary research". It's interesting to see the illustrations of the time, because they give information about what people actually wore, rather than the idealized and/or simplified versions in our head. This book, called May's Doll: Where Its Dress Came From describes the sources for all the elements that went into May's dress. So for those of you who collect dolls, it's intersting reading about the various countries involved in making May's dress. Click the image below to see the original book at Google Books. MAIDA - "Making Antique Inspired Dolls & Accessories"
Toys of the past speak to a simpler time. As collectors we treasure them and as artists we are inspired by them. 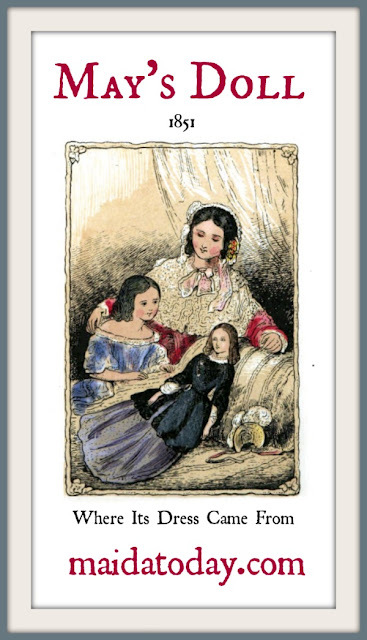 Maida Today features pictures of antique dolls and writing about antique dolls as well as articles about making antique inspired reproduction dolls and accessories inspired by antiques. The writing and images on this site are copyright by Dixie Redmond or by the artisan who submitted the writing and images. Please respect copyright and do not use the images or republish content in any format without permission. Can This Doll Be Saved? Want to Share Your Antique Doll? Are you an antique doll collector and have an iconic antique doll that you would share with the Maida Today readers? Please contact Dixie at northdixieATgmail.com (replace the "at" with the @ symbol). Copyright 2010-2019 Dixie Redmond (unless otherwise stated). Simple theme. Powered by Blogger.